On Fridays here, we've featured soul music on the Soul Corner in 2011-12, and then throughout 2013, garage rock on Friday Nuggets. For 2014, we are highlighting the "world's greatest rock and roll band". Self-proclaimed? Perhaps, though as Muhammad Ali (and Dizzy Dean before him) said, It ain't bragging if you can back it up. 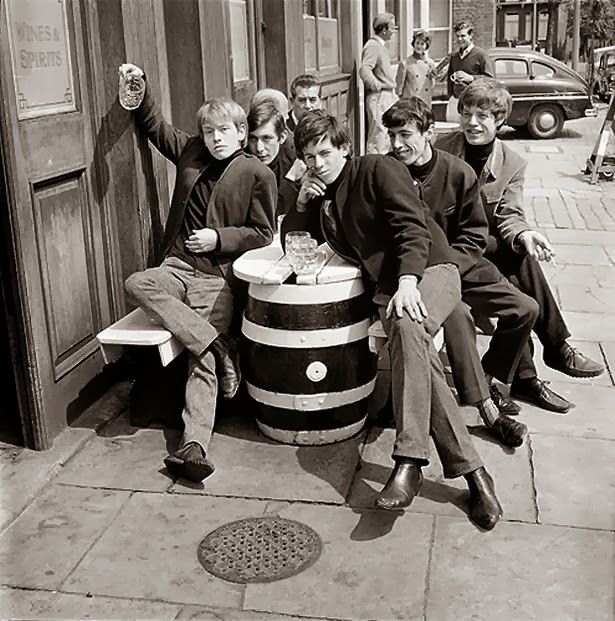 They don't need much introduction, but The Rolling Stones were formed in London in 1962. They've had personnel changes through the years but three of the original core perform as The Rolling Stones to this day - singer Mick Jagger, guitarist Keith Richards and drummer Charlie Watts. They recorded 24 LPs, numerous singles, live sets, compilations and so forth, the catalogue extensive. The Rolling Stones have reportedly sold more than 1.2 billion records (yes, with a b) in their career. One of our central thesis points at this feature will be to showcase the spectacular songwriting of Jagger/Richards as they are always credited. 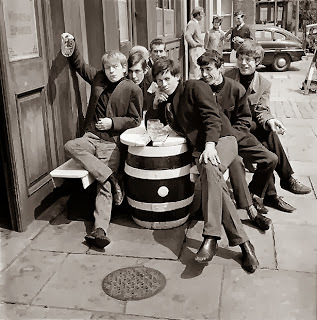 Forget the stage props, hype machine, drugs, feuds, supermodels and all the rest of it - The Stones thrived and endured because they wrote a catalogue of absolutely great songs, certainly many of the best rock'n'roll songs of all-time. They have few peers as songwriters. They were great students of American blues, soul and R&B, and they also covered many songs, particularly in their early years, as was more customary in that era. As I was tending bar in my youth, a crispy critter of LSD self-experimentation remarked, " I love flashbacks - they're free." As you reflect on this statement and listen to Reverb Radio, ponder this. The source of the quote started talking in rhymes like Yogi Bear, took off three years from school, traveled to Nantucket to become a lumberjack. and is now a respected neurosurgeon. The pranksters from Reverberation Radio take us along for a headlong dive into the same psychedelic pool of the mid 60's. These impeccably selected examples of a great lost album (The Misunderstood), acid charred musical ruminations (Skip Spence), nascient country rock (Dillard and Clark), pre Electric Avenue Eddie Grant (The Equals),a godfather of rap (Gil Sott-Heron) will give you a journey into the center of the mind of one of the leading neurosurgeons in America. 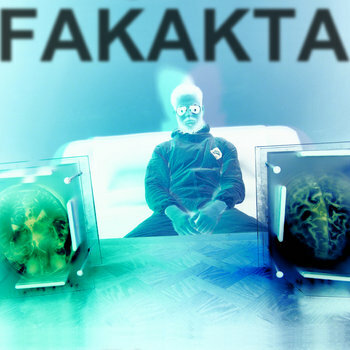 Fakakta is a Yiddish word meaning crazy, screwed up, fucked up and the like. It also is a musical collective of Baltimore and New York City musicians headed by Nathaniel Safren. Safren wrote the songs and produced the album. Other participants were Matt Longo, Jared Everett, Allison Porter, Carlos Fonseca, Andy Felix, and James Leddy. Their self-titled, five-track EP is available for "name your price" at the Bandcamp link below. The songs are eclectic, unusual and often defy easy categorization. The EP begins with the gentle synth pop of "Take You Home", which is similar to the songs TV Girl has released in the last couple years. "Casual Encounters" is more urban pop, while "Twitch" is ragtime. "Fever Dream" is a not-quite-traditional indie pop song, and the EP closes with "Christina", a piano instrumental. Despite that description, it seems to me that it all works, particularly the first three songs (which are presented below). Give it a try - it is a fun way to begin the new music year. Be Forest is an Italian quartet consisting of Costanza Delle Rose (bass and vocals), Erica Terenzi (drums and vocals), Nicola Lampredi (guitar), and Lorenzo Badioli (synths). They will be releasing an album entitled Earthbeat in early February via We Were Never Being Boring. But you can check out their brand of shoegaze here with "Captured Heart" and "Colours". Toronto singer-songwriter Mark Martyre creates poignant stories, and adorns them with just the right amount of accompaniment. Mark's 2012 release, Down, Record, impressed me (link), so I was pleased when he followed it up with this year's London. After multiple spins, I think this is about the best late night music I've heard this year. With poetic lyrics, a touch of guitar, piano, violin, cello and accordion, and Mark's velvet and gravel vocals, the songs swirl around you like pages of your life ripped from your diary and reinterpreted for a new day. Mark describes his music as folk music, so I'll live with that description. However, it would be most unfortunate if his work was dismissed by those who have a narrow view of folk music. Consider the guy your troubadour, your new inner voice, your invisible buddy -- whatever. Just don't ignore him. London is a very good listen. 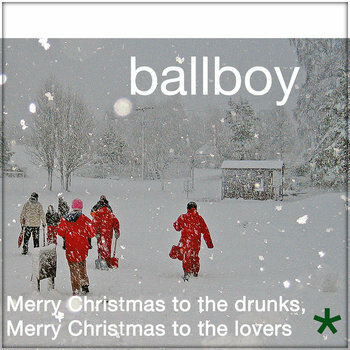 I generally don't seek out Christmas songs by modern artists, but for me Ballboy isn't just any artist. And my faith in their art is justified by Merry Christmas to the Drunks, Merry Christmas to the Lovers, a mini-album they released for the holidays. Consisting of six tracks of indie pop/modern folk that will nudge the nostalgia sensors in your brain and tug on your melancholy heartstrings. Here are the opening and closing tracks; you can stream/purchase the record at the Bandcamp link. You may well find that these songs will become a regular feature in your holiday playlist. Ballboy is Gordon McIntyre, Nick Reynolds, Gary Morgan and Alexa Morrison. Additional assistance was provided by Lucy Pringle and Katey Lee. Merry Christmas to the Drunks, Merry Christmas to the Lovers was recorded by Pete Harvey at Pumpkinfield Studios in Perthshire and Gordon McIntyre at Housechurch in Edinburgh, and was recorded live with the members facing each other. Another day, another gem of a release from Fullerton, California's Burger Records - Shine Your Light from Gap Dream. Who is/are Gap Dream? The answer is that Gap Dream is Gabriel Fulvimar, who in late 2012 moved from Ohio to live at Burger Records. About that time he started writing the songs that would become Shine Your Light. Under the circumstances, it is unsurprising that Burger Records was Gabe's choice to release the album. The question is, did the Garage rock powerhouse that is Burger make a good decision in releasing Gabe's sophomore release? I think the answer is "yes". While Burger isn't known for synth pop - and Shine Your Light is synth/bedroom pop - the label is unafraid of stepping outside the borders of garage rock when they detect talent. Moreover, to my ears there is a garage rock sensibility to this release that proclaims "I belong at Burger". And a good thing, too, because who wants to be evicted during the holidays. The album presents multiple facets of Gabe's sound. Some tracks are dark (e.g. "Snow Your Mind") while others have a sunny pop feel (e.g. "Fantastic Sam"). The production allows for both grit and gloss, and the arrangements allow plenty of space for the instrumentation to carry the mood in between the vocals. If you are going to search for influences, you probably will bring up Eno, Alan Parsons, Giorgio Morode and California surf pop. The overall result is an album that I rely on more for atmosphere than specific songs or lyrical message. But that isn't a knock on the album. Music serves many different purposes in life and this one is good for filling a room and setting a mood. Check out some tracks below. Mavis Gary is Trick Mammoth's Adrian Ng, vocalist, guitarist and a songwriting talent. Frankly, the young Dunedin musicians such as Ng, Millie Lovelock (Astro Children; Trick Mammoth) and Sam Valentine (Trick Mammoth; Males) are so prolific I don't know which projects are side/solo projects and which are the primary effort. Perhaps trying to analyze it in such fashion is simply a fault of my own and such rankings aren't relevant to the artists. In any case, Ng has gathered of his ten sparkling lo-fi guitar pop nuggets in Pin Me Up. The album features layered vocals, sweet chord progressions and haunting melodies. There is a good bit of jangling guitar and a dose of glam and sunshine. You can sample three tracks below and stream the entire album at the Bandcamp link. Adrian has made the album available for download for "name your price". If you give him a bit of money it may help him write more songs, and I think that is a good thing.